Graffiti knitting: the art of the sneaky stitch. I knit, I venture into the city, I yarnstorm, I take far too many photos, I run away giggling. 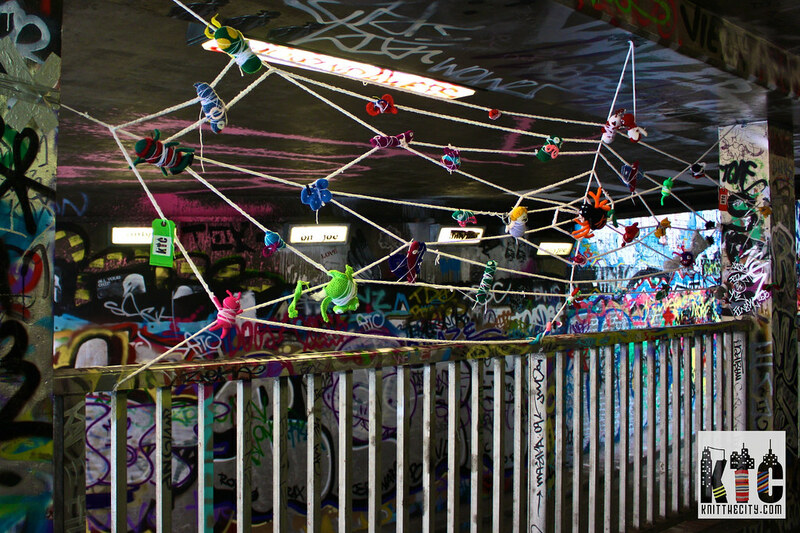 I have been a graffiti knitter (also known as yarnstorming or yarnbombing) since 2007, but took it up in earnest in 2009 after a terrifying incident involving the London Underground, a mechanical ‘Tube Sanitiser’ and several courageous Tube Mice. I escaped with my life, my yarn and eerie knitting powers. On that day in the dingy underbelly of London Deadly Knitshade was born. What is graffiti knitting? Graffiti knitting or yarnstorming or yarnbombing or guerrilla knitting is the art of using items handmade from yarn to create street art. The artist creates an item using knitting or crochet, they take the item into a public place, they install the piece in that public place, they run away giggling. It’s really as simple as that. What’s the point? That’s a bit like asking how long a piece of string is. There are loads of reasons why people make woolly art. Each yarnstormer has their own reason. I guess you’ll have to ask them. If you really want to get picky then you could well ask the questioner why on earth they would ever do anything fun, creative or unusual when they could be doing something helpful and practical. The electricity used to watch that episode of Eastenders could be used to run x amount of life support machines. Right? We all have to live but how we live is up to us. George Bernard Shaw one waffled “Without art, the crudeness of reality would make the world unbearable.” There is art in every single thing around you from your slippers to the station stairs on your morning commute. Some art is a little more slap-in-the-face obvious but what a beautiful world it is when art rears its interesting head. It can be a very effective style of graffiti, especially on a grand scale. Like its cosy sister style it can be epic and full of many tales or a teeny tiny scene with only a few characters. What does the Stitched Stories idea have to do with you then? In 2009, after a handful of ‘cosies’ done on my own and with Knit the City, I was already bored of knitting square and socks to make cosies. I had the wild idea that I wanted our woolly street art to have a bit more of a purpose than simply being ‘knitting on something’. I’m a storyteller at heart so it made sense to me to tell a story with my stitching. I planned out Knit the City’s Web of Woe, a 13-foot spider web full of screaming and struggling creatures, and KTC and I brought it to life. The internet went wild. Blimey. The woolly Web of Woe: a graffiti knitting first, donchaknow. After that I engineered whole installations with my sneaky stitching crew Knit the City. We started conjuring toys and characters to create tales from that point on from the characters in the Nutcracker attacking the Royal Opera House Ballerina Statue, to six yarnstorms based on the Oranges and Lemons nursery rhyme on the site of each existing church. History, stories, stitching. My idea was to give my graffiti a voice, and most importantly a sense of humour. Socks on lamp posts are only funny for so long, but a Cheshire Cat in a tree will have people grinning until the pigeons eat it. No one else was doing it at the time so it was a bit of a leap of fibre-based faith. Street art sculpture in stitching. Madness. I’m sure people were making items other than cosies before this point, but I have never come across anyone who used their graffiti to tell a tale before we did. I’ve even published a book about it. So it must be true. And my giant knitted squid will wrestle anyone who says otherwise. Groups all over the world are now creating stitched stories of their own. The idea that it’s spread so far and wide makes my head pop if I think about it too hard. Why do you call it yarnstorming when most people call it yarnbombing? I conjured the term ‘yarnstorming’ as a squishy, less violent and more creative term for ‘yarnbombing’. A necessary adaptation I made due to not wanting to use bandy about the word ‘bombing’ on the BBC news coverage of the first graffiti knitting event of my sneaky stitching collective, Knit the City. It’s got less destructive connotations and the whole point of what we do is that it’s removable. We’re storming not bombing. A fibre-based force of nature! Aren’t graffiti artists meant to be anonymous? That’s really up the artist. Oddly, even though I tried to keep to hidden identity thing going, I’ve become a bit of an infamous graffiti knitter. I did start off shrouded in woolly mystery. Those were the days. But as my yarnstorms got more attention it was much harder to hide out. Especially when you’re carrying an 8-metre handknitted squid through the Natural History Museum. If you like it then you shoulda put a squid on it! Then when my Knit the City: A Whodunnknit Set in London came out that was that. My mediawhoring has made it into the Guardian, and been on BBC News and the BBC World Service. I have exhibited my work at Tate Britain, the Natural History Museum, the V&A and the Science Museum in London, and in Germany and New York. The reason I chose to put a story to my identity was because I survived an epic battle with cancer. And that kind of thing makes you want to tell other people who are battling, or worrying about someone who is battling, so they can see it can be beaten. And you have some kind of collective too, do you? 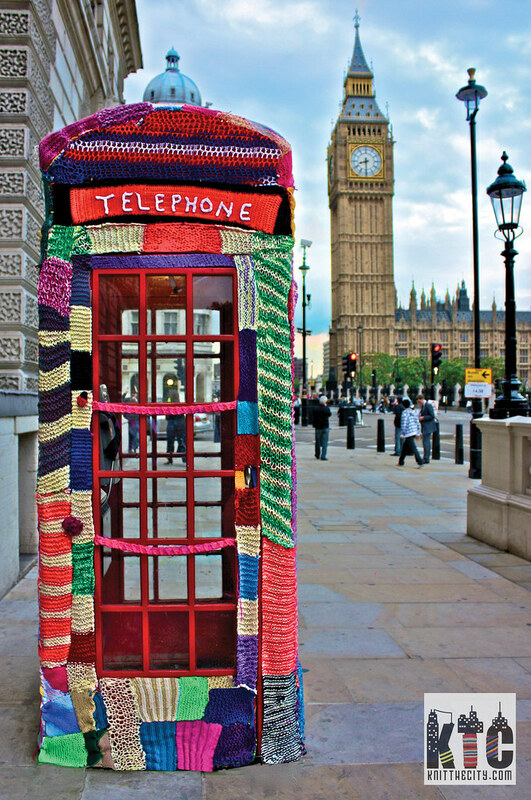 I founded and continue to wrangle Knit the City, London’s first sneaky stitching collective, vaguely famous for our Telephone Box Cosy in Parliament Square. There are four of us in our crew: me, The Fastener, Shorn-a the Dead and Lady Loop. We are all as passionate about graffiti knitting as each other. We love what we do. Probably worryingly so. And what are Whodunnknits? Discernible by their Whodunnknit tags, my yarnstorms can appear anywhere. They like to get out. They demand to be noticed. They live in this city every bit as much as any of you do. You can read more about my graffiti knitting check out My Graffiti Knits page. My every day self and Deadly Knitshade exist side by side, day to day, in the same body. An episode or ‘yarnstorm’ could happen at any time. In any place. Deadly Knitshade arrives without warning. Sometimes in the least convenient of places. It is my yarn-flavoured burden to carry. And it’s often quite embarrassing at parties. 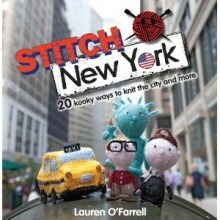 What’s the Knit the City book about? Knit the City: A Whodunnknit Set in London (published by Summersdale) is the tale of the first few years of Knit the City, featuring the stories each yarnstorm told. It features my photos of each of our yarnstorms in detail if you want a close up look at our sneaky stitched stuff. It also tells the woolly tale of how KTC first got started in our yarnstorming path. And there are two kooky little knitting patterns in there too, should you feel the urge to go a sneaky stitching yourself. You’re talking about yourself rather a lot and turning up in all kinds of media. Don’t you worry people will think you have a giant ego you can see from space? I do. But the thing is that I have this overwhelming urge to live as much as I can in the time I have left. And also to try to shake people up with my stitching and encourage them to grab life by its woolly hands and take it dancing. It’s just not something you can do quietly. For every frown I get there are a hundred people taking my lead and having wild woolly times. So I put up with the grumps. The grins are so much more worthwhile. Don’t go! I have more questions! Hop over to my contact page and drop me an email. If you can manage to get it past my ravenous guard squid I might even reply. Good luck, sneaky stalker.